Looking rather the worse for wear as she approaches the deepwater terminal at Hunterston today, the bulk carrier CALM SEAS dates from 1999, when she was built in Japan, by Hashihama Shipbuilding. This 74,047 tonne deadweight ship is 225.0 metres long, and has a full load draft of 13.87 metres. 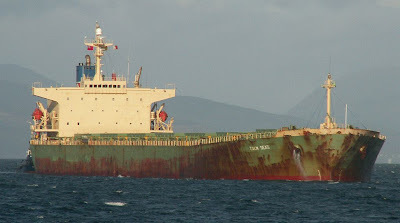 She is registered in the Marshall Islands, and managed by a Greek company, Allseas Marine SA. Now bearing her fourth name, she was completed as WORLD ROMANCE, becoming LITTLE ATHENA in 2005 and later in the same year, ALTEREGO. She was given her present name at the beginning of this year. Looks like she could do with a few licks of paint! !